How many beers does Elysian release a year? Or month for that matter? Hell, one could probably start looking at their weekly schedule. I seem to find a new beer from them every time I go to the store. That's not a bad thing, mind you, as the diversity of their beer is pretty impressive, and the quality is more often than not at least pretty good. Superfuzz is just that: pretty good, or even quite good depending on your point of view. It's a blood orange pale running in at a session-y 5.4% ABV with 45 IBUs. A mild ale and one that, as the Blood Orange part of the name suggests, screams summer. I quite liked it, but wish there was a bit more of a blood orange flavor to it. I certainly can understand why Elysian would want to keep it balanced, but just a liiiittle bit more of a kick would have sealed the deal for me. It does have the traits one would expect from a blood orange ale, of course. The color is deep orange, bordering on red, topped by a good white head. Give it a whiff, and the orange hits well, flanked by malts and hops. The latter comes off as something one would expect from a standard pale. Then, the flavor... I like it, but, as already mentioned, I wish the blood orange was just a liiiittle more pronounced. The standard pale backbone is not bad, but also not insanely exciting. Had the blood orange been just a liiiittle more flavor forward, I'd say this would have been a perfect summer ale. All in all I might be too hard on the Superfuzz. I liked it. I think my opinion will be more positive when we approach the eighty degree mark, and the beer is sipped as a summer seasonal. Either way the Superfuzz is one worth trying. It is at least pretty good. 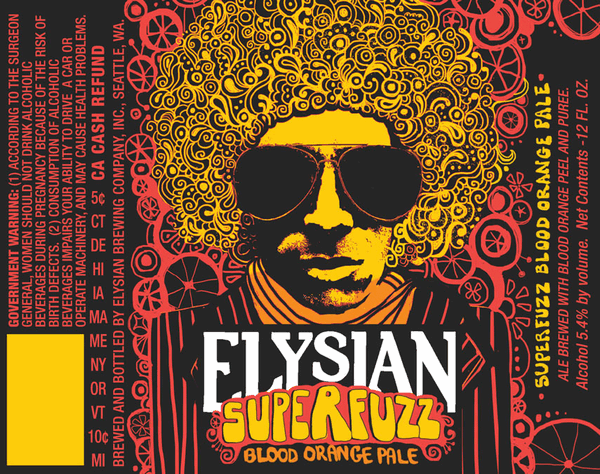 Vote for Elysian Superfuzz Blood Orange: It’s your civic duty!